Stars explores my desire to find some balance between a relationship with the wild places of my youth and a pervasive sense of disconnectedness from the natural world. The Western landscape tradition embodies a pairing that James Elkins calls ‘the subject-object relationship’. Typified by the ‘scenic viewpoint’ or tourist panoramic overlook, we gaze, often through binoculars or telescopes, at wide vistas and dramatic seascapes, and are awed and overwhelmed. But this landscape experience often alienates the viewer from the scene and, just as the landscape itself becomes an object, a separation arises between them. Today, the majority of people live in urban or semi-urban environments, experiencing the landscape from a distanced position mediated through technology and various media. From this viewpoint the notion of the landscape in all its sensuous materiality, our being within it rather than outside it, seems beyond reach. 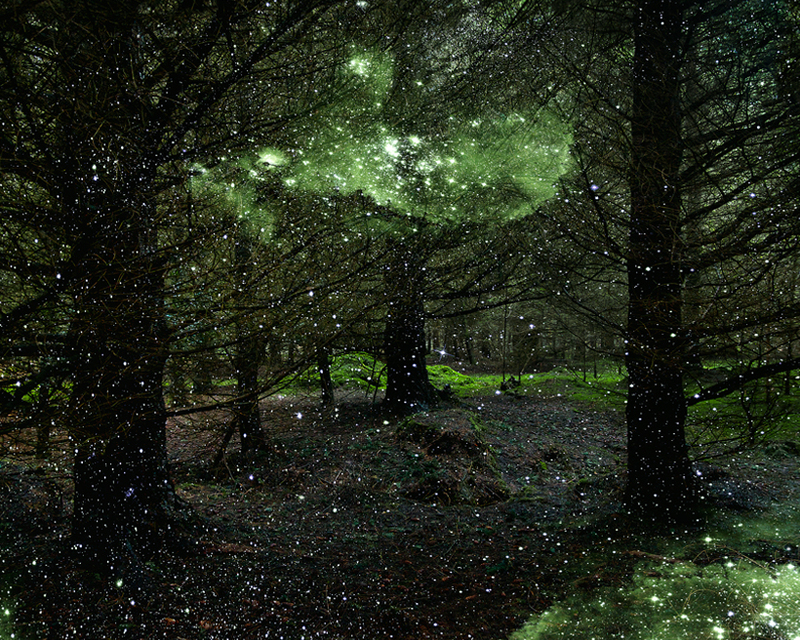 Stars addresses this distancing by drawing the viewer right into the heart of a forest, which still holds mystery, and offers the potential for discovery and exploration. It considers the fragility of our relationship with the natural world, and the temporal and finite nature of landscape as a human construct. Mature and ancient forest landscapes are interposed with images captured by the Hubble Telescope of the Milky Way, Omega Centauri, the Norma Galaxy and embryonic stars in the Nebula NGC 346. Each image links forest landscapes with the intangible and unknown universe, juxtaposing my personal experiences of the forest—its physicality and tactility, against a profound and fundamental otherness, an alienation that separates us from a truly immersive relationship with the natural world. Ellie Davies (b. 1976, United Kingdom) lives in London and works in the woods and forests of Southern England. She completed her MA in Photography from London College of Communication in 2008. She is represented by Susan Spiritus Gallery in Newport Beach, California, A.Galerie in Paris, Sophie Maree Gallery in The Netherlands, Brucie Collections in Kiev, Art Gemini in Singapore and Crane Kalman Brighton Gallery in the UK. Davies’ work was selected for the Royal Photographic Society’s 158th Annual Print Exhibition (2015) and was awarded ‘Selector’s Choice’ by Louise Clements (Director of Quad Festival, Derby). The exhibition opened at The Truman Brewery in London in October 2015 and has since travelled to seven venues and been viewed by 120,000 visitors. Her work has been selected for the Aesthetica Art Prize 2016 Exhibition. Davies was recently awarded Gold in the Fine Art Landscape category of the PX3 Awards 2015, and First Place in the 2014 Kontinent Awards Fine Art Projects Category, Top 50 in the Barcelona International Photography Festival, First Place in the 2014 Art Gemini Awards, and two Honourable Mentions in the Moscow International Photography Awards 2014. She also received an Honourable Mention from the jurors of Inside Out 2014 at PH21 Gallery in Budapest, and was selected as a finalist in the 2013 London International Creative Competition. She was awarded an Honourable Mention in the Professional Women Photographers International Juried Exhibition 2012. Davies was selected for the Lens Culture International Exposure Awards 2010, and received 1st Place in the Fine Art Landscape category of the 2010 PX3 Paris Photo Prize, The Exeter Phoenix 2010 Audience Choice Award, ArtSlant Showcase Juried Winner in 2010 and 2011, and Commended in the LPA Landscape Awards 2010. 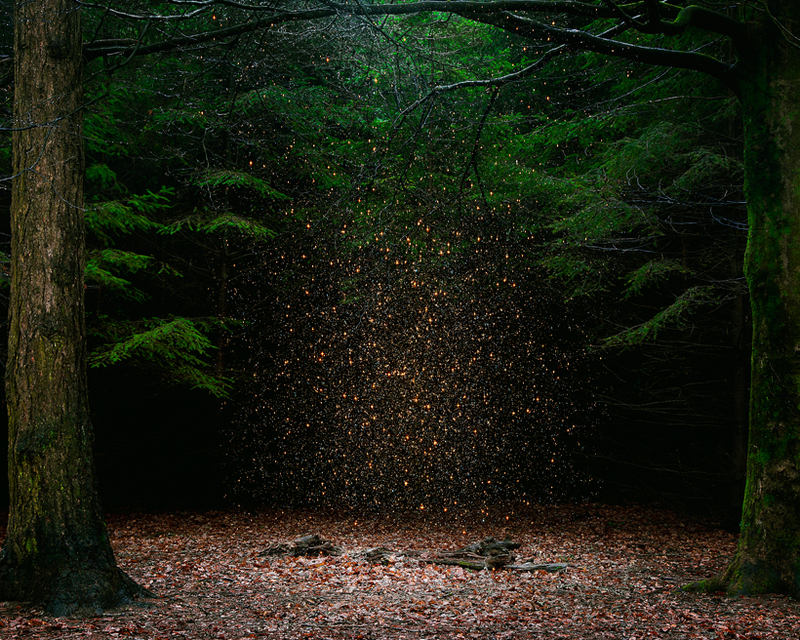 Recent books include Into The Woods, a self-published photobook made with Bob Books, which includes Stars, The Gloaming and Between the Trees series’ in their entirety, with text by Ellie Davies and Miranda Gavin (Hotshoe). 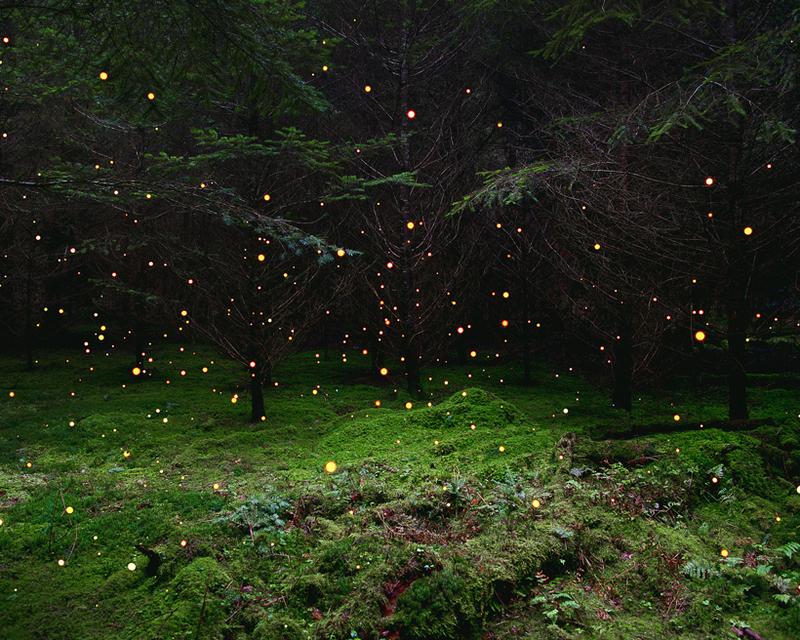 Also, WUD: Four Walks in the Fictional Woods, a limited-edition hardcover photobook published by Tangerine Press in December 2012, Open To Interpretation: Intimate Landscapes – Published October 2012, and Behind the Image By Natasha Caruana and Anna Fox published by Thames and Hudson in 2012.